A late penalty stroke given to Dustin Johnson never got in the way of his first major win. 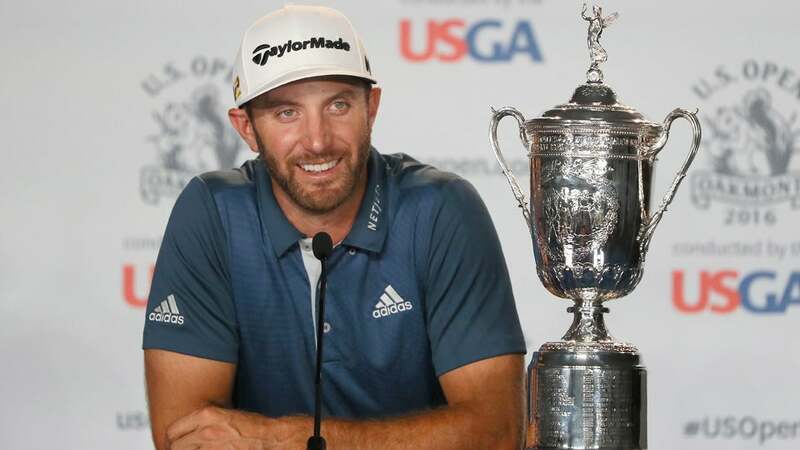 The United States Golf Association said it regrets the distraction it caused by not waiting until the end of the final round of Sunday's U.S. Open to issue a ruling on Dustin Johnson and his 5th green controversy, golf's governing body said in a statement released Monday evening. Johnson, who won the U.S. Open by three strokes despite being assessed a penalty after his round, alerted an official when his ball moved on the 5th green. He said he had not touched the ball or grounded his club, so the official told him to putt out with no penalty. But more than an hour later while on the 12th tee, Johnson was told he might be assessed a one-stroke penalty at the conclusion of his round, when it would be reviewed. Other players on the course were soon told about the possibility of a penalty. In the 620-word statement, the USGA said it "created uncertainty about where players stood on the leaderboard after we informed Dustin on the 12th tee that his actions on the fifth green might lead to a penalty. This created unnecessary ambiguity for Dustin and the other players, as well as spectators on-site, and those watching and listening on television and digital channels." According to the statement, rules officials gathered all the relevant evidence surrounding Johnson's putt and decided "that it is more likely than not that the player's actions caused the ball to move." Before, and even after, the ruling was announced, PGA Tour players voiced their displeasure with the USGA's handling of the situation on social media. It became a moot point, however, when Johnson birdied the final hole to lead by four, thus securing his win regardless of the penalty assessment. "We accept that not everyone will agree that Dustin caused his ball to move," the statement read. "Issues under Rule 18-2 often require a judgment where there is some uncertainty, and this was one of those instances. We also understand that some people may disagree with Rule 18-2 itself. While we respect the viewpoints of those who disagree, our Committee made a careful and collective judgment in its pursuit of a fair competition played under the Rules of Golf." Jack Nicklaus was on the 18th green when Johnson finished, and was among those who criticized the USGA's handling of the situation. Golf Channel analyst Brandel Chamblee did the same during a live show later that night. Johnson finished at four under to claim his first major. Jim Furyk, Shane Lowry and Scott Piercy tied for second at one under. You can read the USGA's complete statement below. Our team at the USGA has seen and heard a great deal of discussion and debate about the ruling on Dustin's ball moving during the final round of the 2016 U.S. Open Championship at Oakmont Country Club. In addition to the explanations we offered upon the conclusion of the final round, we add these comments. During any competition, the priority for Rules officials is to make the correct ruling for the protection of the player(s) involved and the entire field. In applying Rule 18-2, which deals with a ball at rest that moves, officials consider all the relevant evidence – including the player's actions, the time between those actions and the movement of the ball, the lie of the ball, and course and weather conditions. If that evidence, considered together, shows that it is more likely than not that the player's actions caused the ball to move, the player incurs a one-stroke penalty. Officials use this "more likely than not" standard because it is not always apparent what caused the ball to move. Such situations require a review of the evidence, with Decision 18-2/0.5 providing guidance on how the evidence should be weighed. Our officials reviewed the video of Dustin on the fifth green and determined that based on the weight of the evidence, it was more likely than not that Dustin caused his ball to move. Dustin's putter contacted the ground at the side of the ball, and almost immediately after, the ball moved. We at the USGA deeply appreciate the support of players, fans, and the entire golf community of our championships and our other work for golf – and we appreciate your feedback as well. We have established an email address ([email protected]) and phone mailbox (908-326-1857) to receive comments. We thank you for taking the time to share your thoughts.